In process environments, accuracy and reliability must go hand in hand with flexibility and functionality. You need a proven product that will run like you expect it to, regardless of how and where you install it. For viscosity control and measurement, the standard system in use in process environments worldwide is Cambridge Viscosity’s VISCOpro line. 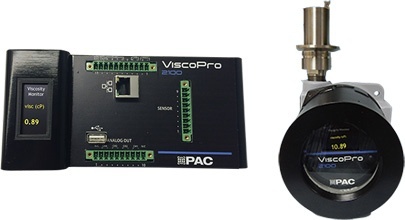 VISCOpro products feature adaptable interconnectivity with optional single and multiple-channel interfaces. Field-adjustable calibration and remote troubleshooting capabilities mean you can devote more time to your process line. Whether you need an in-line or in-tank solution, no matter what pressure level or vessel size, VISCOpro electromagnetic viscometers are the high-performance/low-maintenance option you can depend on. With self-cleaning sensors capable of real-time/all-the-time control and monitoring, our electromagnetic viscometer solutions provide the data you need when you need it. The ViscoPro 2100 delivers highly reliable and accurate data to users in real-time. It is the ideal viscometer for almost any refining, petrochemical, or coatings application. Featuring menu-driven electronics, the VISCOpro 2000 is the ideal solution for single-channel control needs, offering 13 measurement ranges and memory control for up to 40 fluid settings. The VISCOpro 2000 displays viscosity, temperature, and temperature-compensated viscosity (TCV) parameters, along with alarm signals and control outputs. Cambridge Viscosity is committed to solving the diverse and challenging viscosity measurement requirements of its customers. Our engineers are able to develop specialized instrumentation, electromagnetic sensors, and software to solve the most critical demands. For example, we have created sensors designed for high-temperature conditions that can operate at over 375°C, corrosive-resistant sensors, and systems that comply with rigorous 3A sanitary conditions. We invite you to contact us with your special requests.